Dissemination- Collaboration with Staffordshire University ‘Centre of Science’ Started October 2012-ongoing. Synopsis: Project researching ways artists can use visual skills to communicate ideas from other disciplines. 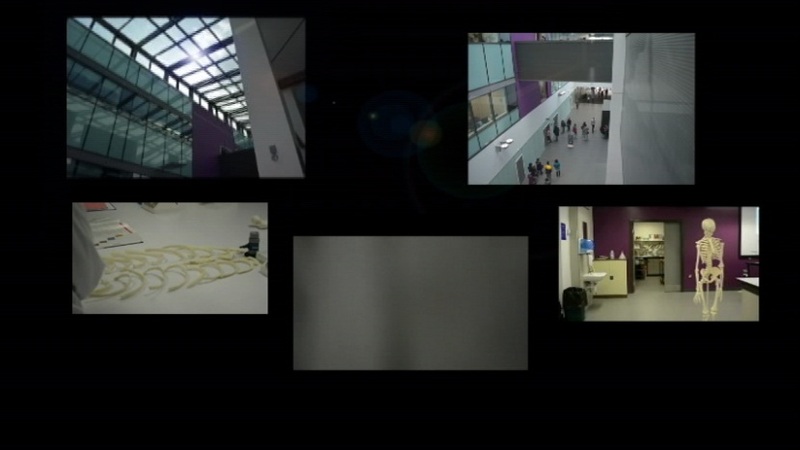 The project focuses on the use of ‘head cam’ style technology exploring the concept of a discerning eye capturing all aspects of the building and the events that happen in it using real time production methods. The footage was used to create a multi-screen installation which explored ways to conceptually map the lived environment over a period of time. To produce the work an inclusive approach was needed and therefore the project allowed individuals the opportunity to in-put into the work and offered an insight into the creative process giving a new insight into the roles of Arts and Sciences with in Society. The Work is developing toward a NESTA and Wellcome Trust application to create a large scale video installation exploring the complexity of the building and the activities that happen with in it and to work in collaboration with the psychology team to research new ways of mapping human movement focused on the research area of ‘Location memory’. Abstract: To collaborate with the new ‘Centre of Science’ to form new speculative artworks and investigate moving image and image capture technology as a way to create new ways of ‘mapping’ buildings by recording time and space, which complement new knowledge and offer formulas for cross-disciplinary collaboration. The potential of the work produced is that of a new methodology that would offer both artistic and commercial possibilities. Artistically the work creates new discourses with technology, its users and the potential to open up new narratives about how space ( in this case the ‘Centre of Science’) is perceived and experienced, thus offering new avenues of communication and understanding of not just the art work but the subject it is engaged with. Commercially the offering is of a ‘product’ that can re-evaluate and re-represent a space with the potential for company’s etc. to use this as a creative way to view their businesses or to allow others to do so. Exhibition: The Science Room, Staffordshire University ‘Centre of Science’ October 2013.